The Infiniti M30 saw production between 1990-1992. During those production years of the Infiniti M30, only the later years of 1991-92 was the M30 convertible manufactured and made available in North American markets. In 2005/6, many of F31club members throughout the US, bugged the Infiniti dealerships for parts and information. Some of the guys with convertibles, Sundowner, Zydeco, DrewZee87T, Gregt, and 91ragtop were the ones trying to get as much information about the convertibles for F31club to archive. The official production numbers for convertibles was information that might have been lost through time and since the M30 is somewhat of an obsolete car to Infiniti, probably not a priority. Anytime the topic is brought up, there is all speculation. 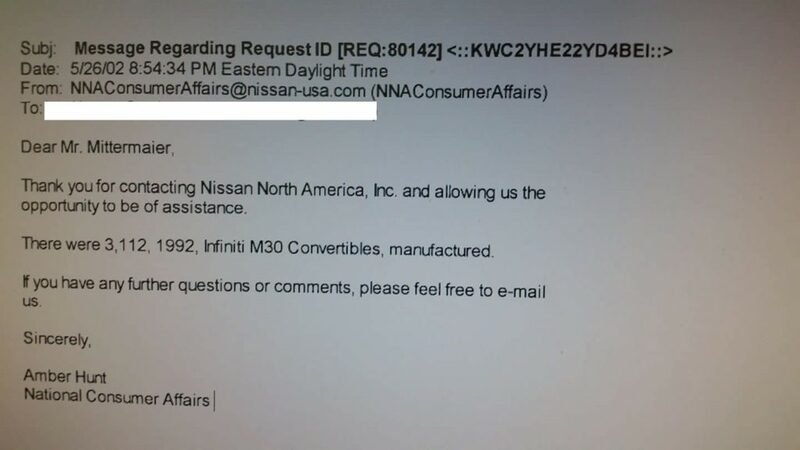 During what seemed to be a routine conversation about convertibles and talking about numbers, Alan M. said he had an email stating that there was 3,112 1992 M30 convertibles manufactured. I was excited to hear this and asked if he could post the email. Alan said he would once he gets back from vacation. The email was from Nissan North America and this was in 2002. Very interesting! The statement was addressing M30 convertibles in 1992. Alan mentioned he did not ask about 1991. This is simply amazing to anyone who is a true enthusiast of the M30. It definitely contradicts the “2500 M30 convertibles made”. Coming from Nissan’s corporate offices, it is even more valid source. I got permission from Alan to post this. Not only that, I emailed them myself and asked about 1991’s production numbers. This may very well be the definitive answer to how many M30s ASC produced to be convertibles. This entry was posted in blog, history, opinion, review.